The key ingredient to making herbal salve begins with infused oils. 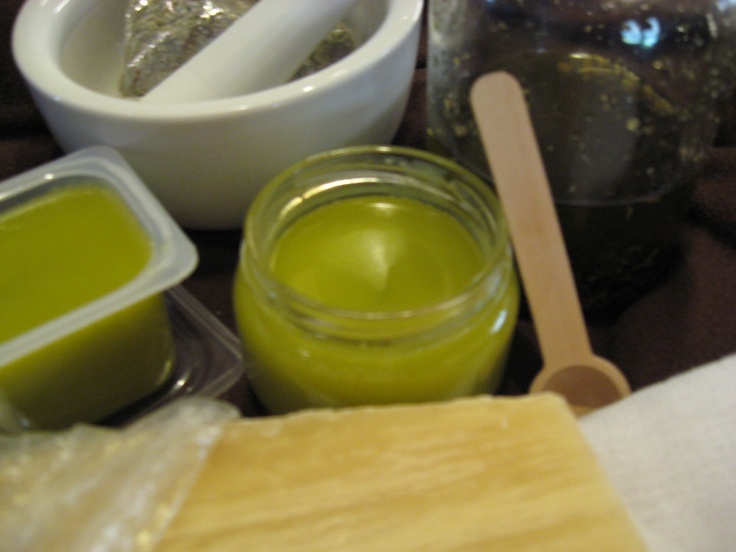 Infused oils are used to make any oil-based apothecary items, such as creams, massage oils and salves. An easy way to make infused oils is the “solar infusion method.” Use a jar with a tight fitting lid, and fill it half way with a dried herb of your choice. Fill the jar with oil until it completely covers the herb. Any good quality vegetable oil will do, but if you intend to use this infused oil as a salve, then use olive or almond oil. Place the lid on the jar and store it in a sunny window for 21 days. Give the jar a gentle shake several times during the “solar infusion process.” When it’s fully infused, strain the oil through a triple layer of cheesecloth and store it in a clean, fresh jar with a lid. It’s now ready for future use. In a double boiler, melt the beeswax over low heat. Once melted, add the infused oil. The wax will cause the mixture to solidify. Keep it on low heat until the mixture is clear and liquefies. If it’s very thin, add a little more beeswax. Remove the mixture from the heat and add essential oil. Allow the salve to cool before pouring it into jars or tins. Wait until the salve completely solidifies before capping the jars or tins. Baby food jars are perfect for storing the salve, and so are 1/2 pint jelly jars. Always store the salves in a cool, dry place. They’ll last for well over a year. A few other herbs you might like to try for making salves: Comfrey, German chamomile, Roman chamomile, Plantain, and Aloe. Use the salves on small cuts, scrapes, insect bites, blisters and minor burns.